Versatile yet portable, packed with features and made of quality materials, Omnio Lamp is a lamp you will use daily to bring studio level lighting to all levels of photography. 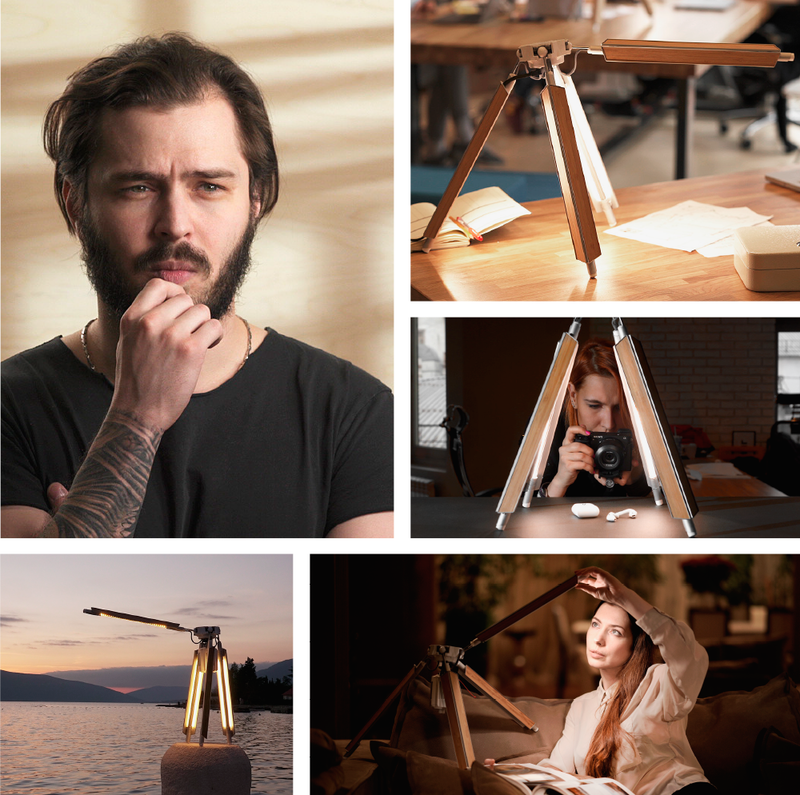 Via crowdfunding, the company, Difference Design, is raising funds to finish production and open a new horizon in traditional professional lighting by creating highly effective, yet affordable professional lamps. Tallinn, Estonia, 2018-Jun-13 — /EPR ELECTRONICS NEWS/ — Omnio Lamp (www.omniolamp.com) is a professional lighting studio on the go. The lamp is portable, adaptable, light weight and packed with features, making it an entire studio-on-the-go. Omnio Lamp was unveiled today on Indiegogo and is raising funds for mass production with a goal of delivering highly-effective, yet affordable tool for professional lighting. Designed with every professional’s needs in mind, the lamp unifies multiple lighting instruments into a single, high quality unit. Like no other lamp, Omnio Lamp has 4 pivoting arms, built-in barn doors, 264 high quality LEDs providing a staggering 4200 Lumens of professional, flicker-free light, and a CRI of 98.9 for skin tones. Four rotating arms give soft light from four different sides simultaneously. When its barn doors are inverted, each arm gives 2 rays of light in opposite directions: one direct and sharp, and the other reflected and highly diffused, enabling ‘painting’ with light and shadows. Equipped with a standard mounting socket for tripods, holders and hooks, the lamp is designed to be on-the go, adaptable, maneuverable and practical. A programmable and intuitive 12-button display enables accurate control of brightness and color temperature with the push of a button. Made of rigid industrial materials and custom electronics, the lamp is light weight, foldable, and easily charged. The company has tapped into the science of light as a catalyst for innovating an effective and affordable solution for professional lighting. Omnio Lamp cuts the need for multiple lighting sources and covers a range of tasks with one product. For anything requiring light, Omnio Lamp provides a specific (and perfect) setting: Interview, photo or video shoot, advanced portrait photography, object shoot, reading or working, outdoor filming or beautiful decor. Professional, multifunctional yet practical and affordable, Omnio Lamp brings a new perspective on how to perceive and use light in photography. Branimir is the founder of Difference Design and inventor of Omnio Lamp, a company focusing on developing smart objects and image based technologies. Branimir is a filmmaker by training, and artist and inventor by occupation. Originally conceived as a compact portrait and item photography lamp, Omnio Lamp has grown to become the most versatile lighting instrument today.